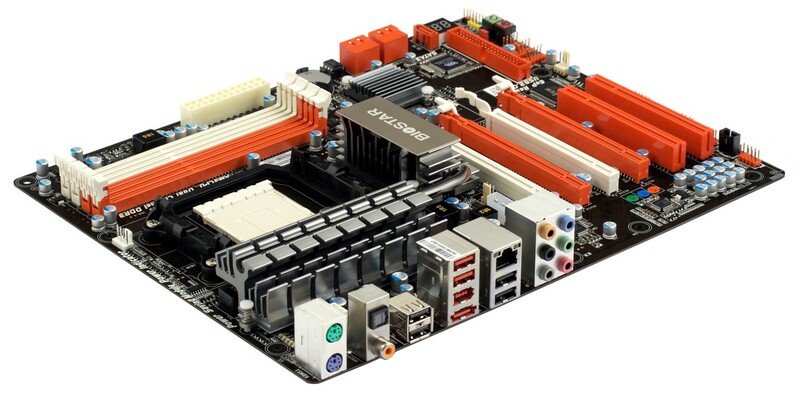 While for the top three motherboard makers top-class chipsets are primarily associated with luxurious high-end motherboards equipped with everything possible (and made to see how much more money enthusiasts are ready to cough up), then for other makers such top-class chipsets are a way to make a bit more money by only implementing chipset capabilities for users who need functionality, not prestige. 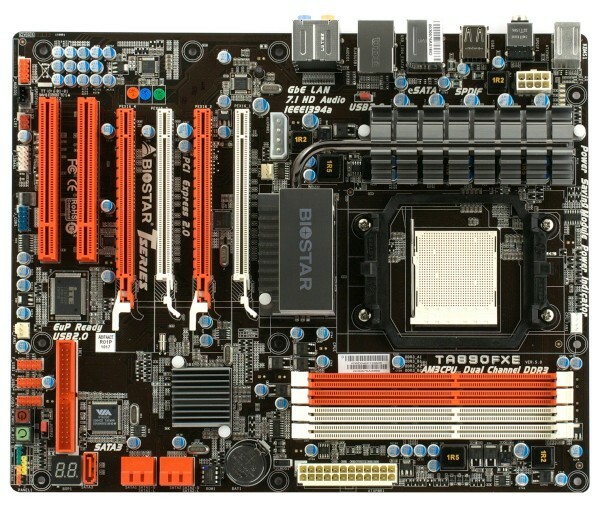 The layout is classic for modern full-size higher-end ATX motherboards. Thanks to horizontal SATA connectors, there's enough space for multiple graphics cards. Note that if you only have two graphics cards, each will get x16 lanes, if installed into slots of the same color. 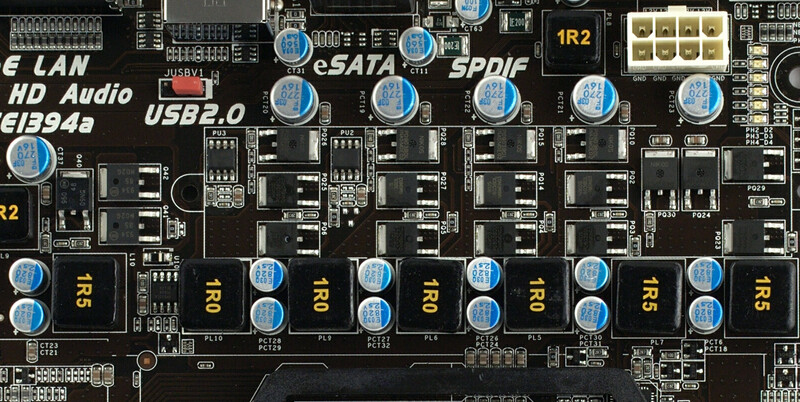 If you have three or four (or other expansion cards) the corresponding pair of slots will switch to x8+x8. You can also adjust the number of lanes manually in BIOS. TA890FXE has power and reset buttons onboard, as well as a POST indicator. The two primary power connectors are accompanied by a supplementary power connector for graphics cards. Formally, this may come in handy in graphics core overclocking, especially if a card has no power connector of its own. Just three fan connectors seem to be to few for a motherboard based on a top-class chipset that will most likely be used in a gaming rig. However, automatic fan speed controls are quite nice. Also note the impressive battery of capacitors in the corner. Those are a part of integrated audio codec circuitry. The backpanel hosts almost every peripheral interface, including eSATA, FireWire, coaxial and optical S/PDIF. There's just no USB 3.0 port, so TA890FXE only offers USB 2.0 support. Well, USB 3.0 isn't obligatory anyway. The cooling system is optimal in terms of heatsink layout. This way any CPU fan will help cool heatsinks as well, considering there's also a heatpipe. The size of both heatsinks hints that the motherboard will only heat up moderately in the typical mode. The CPU VRM has 6 phases. This isn't much for a top-class motherboard, especially considering that 2 phases are dedicated to powering the integrated Northbridge. Nevertheless, idle phases can be disabled dynamically. The 4 phases powering CPU cores feature 3 MOSFETs per phase, the CPU NB phase has 2 MOSFETs. There are 10 x 820µF and 5 x 270µF capacitors, all solid. Processors with up to 140W TDP are supported. The bundle includes 4 SATA cables with metallic latches, 2 power adapters, a ATA/133 ribbon, and a user's guide. 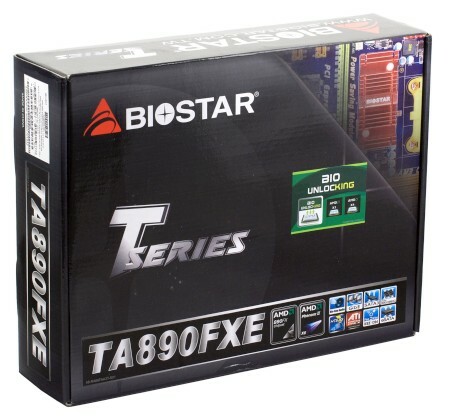 The set of T-Series utilities includes a BIOS updater with automatic search for new firmware versions as well as tools for overclocking and Green Power management. 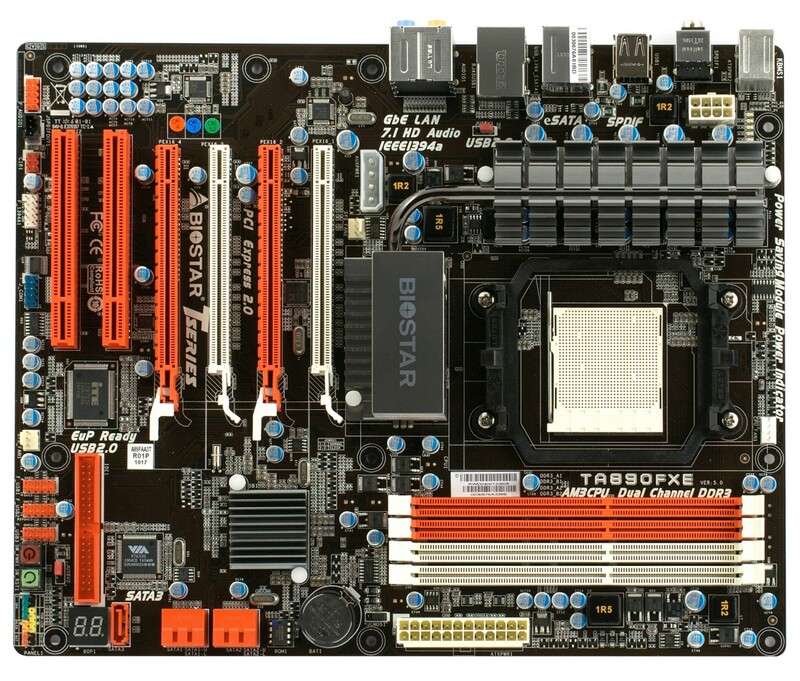 TA890FXE is based on the AMD 890FX chipset (AMD 890FX Northbridge + SB850 Southbridge). It supports up to 16GB DDR3-800/1066/1333/1600, has 5 internal SATA 6Gbps ports (RAID 0, 1, 0+1, 5), and a eSATA 3Gbps port on the backpanel. The list of auxillary controllers is below. Integrated audio based on the 7.1-channel Realtek ALC892 HDA codec; optical and coaxial S/PDIF-Out on the backpanel. Gigabit Ethernet based on Realtek RTL8111DL (PCIe x1). FireWire based on VIA VT6330 (PCIe x1); 2 IEEE1394a ports (one on the backpanel). There's also a PATA/133 port for 2 devices that is used instead of the chipset's. On the one hand, it's nice that FireWire controllers are moving from PCI to PCIe. On the other hand, providing PATA functionality by means of an auxillary controller instead of chipset's native isn't the best choice in terms of compatibility. System monitoring based on ITE IT8721F. Automatically controls speed of the CPU and one of the system fans. The BIOS allows you to choose from Silent or Performance presets or manually set temperature thresholds at which the fan will start or stop. You can also choose a value based on which the minimal fan speed will be selected. Finally, you can adjust how fan speed should be incremented when temperature is increasing. Both 3 and 4-pin fans are supported. The result is inferior to what other motherboards with this audio codec are offering. But users of such motherboards tend to buy standalone sound cards or at least use digital interfaces, of which TA890FXE has both S/PDIF types. However, that issue related to the non-optimal layout of integrated audio circuitry still remains on Biostar motherboards.